Studies on healthcare issues often consume a large amount of time, effort, money and resources to complete. The success of such a study is measured by its end product, namely, a published paper, and its eventual impact on human health. 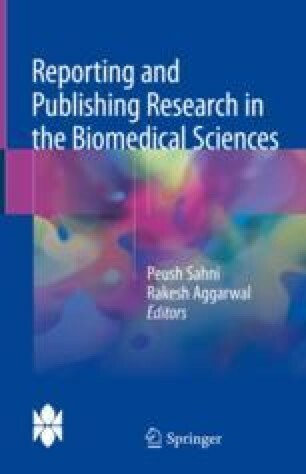 Biomedical scientists are under intense pressure to publish for several reasons as follows: to sustain research funding; to secure a promotion; to continue to be recognized and acknowledged as an expert within a peer group; to get invited to workshops, conferences or meetings; to serve on academic bodies or other decision-making committees; and to secure patents. This intense pressure can sometimes push scientists to publish the same piece of work more than once or, worse still, publish another person’s work as their own. International Committee of Medical Journal Editors. Recommendations for the conduct, reporting, editing, and publication of scholarly work in medical journals. http://www.icmje.org/recommendations/. Accessed 30 April 2015. Committee on Publication Ethics Guidelines on Good Publication and Code of Conduct. http://www.publicationethics.org/resources/guidelines. Accessed 30 April 2015.